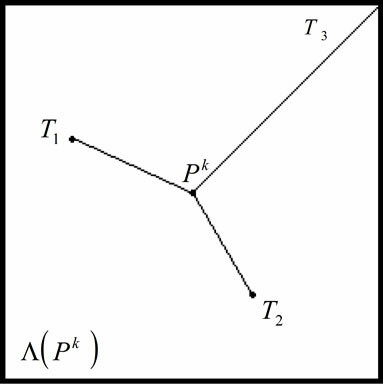 Constrained nonlinear optimization problems are well known as very difficult problems. In this paper, we present a new algorithm for solving such problems. Our proposed algorithm combines the Branch-and-Bound algorithm and Lipschitz constant to limit the search area effectively; this is essential for solving constrained nonlinear optimization problems. We obtain a more appropriate Lipschitz constant by applying the formula manipulation system of each divided area. Therefore, we obtain a better approximate solution without using a lot of searching points. The efficiency of our proposed algorithm has been shown by the results of some numerical experiments. Many real world problems can be formulated in mathematical programming problems, i.e., problems in which an objective function that depends on a number of decision variables has to be optimized subject to a set of constraints . Therefore, methods for solving such problems are of great importance. However, it is very generally difficult to solve a constrained nonlinear optimization problem (hereafter called NLP) and to find its feasible region. A method that uses the Lipschitz condition (Lipschitz constant) has been proposed for solving nonlinear optimization problems [2-7]. It is assumed to be difficult to apply this method to multi-dimensional optimization problems because of the curse of the dimension. We have already proposed an effective method for solving the NLP [1,8,9]. This method uses the Branch-and-Bound algorithm and the Lipschitz condition, and it guarantees that the obtained solution is optimal. This paper presents a new algorithm for solving the NLP; the efficiency of this algorithm is improved by using formula manipulation of the objective function and constrained functions. In this paper, we report that the calculation frequency to obtain a good approximate solution to the NLP has been greatly reduced by using our proposed Lipschitz algorithm. 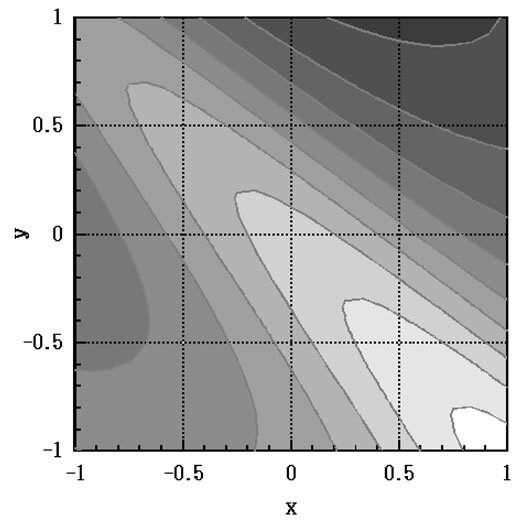 where the feasible region S is a compact body, i.e., S is a nonempty, bounded subset of equals to the closure of its interior, the boundary of S has an n-dimensional Lebesgue measure equals to zero, and the objective function f is a continuous real-valued function defined on S.
where is the Euclidean norm on . Let , and let be an optimal solution so that . and Lipschitzian. In the case of an equality condition, we reduce it into two equivalent inequality conditions as follows. The rewritten forms of are and . In this section, we describe the notations, some definitions, and the basic theorem of the Lipschitz algorithm. the function is said to satisfy the Lipschitz condition. The lower bound of K satisfying the above condition for some function f is called the Lipschitz constant Lip(f) of the function f.
In order to reduce the searching area and improve the efficiency of searching optimal points in the feasible set , the searching algorithm utilizes Lipschitz constants of the objective function and constraint functions . 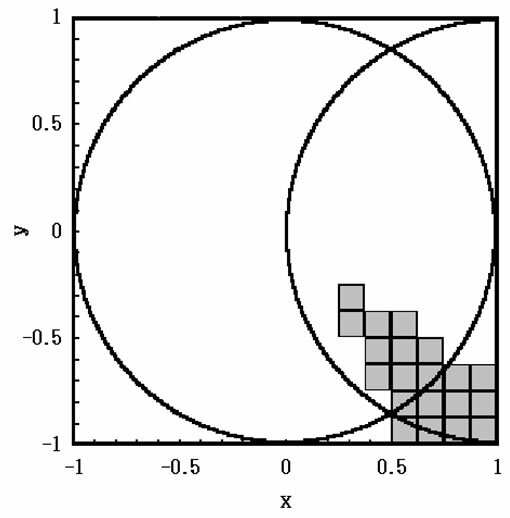 In this algorithm, an n-dimensional interval I is subdivided in each iteration by dividing each by two; therefore, at the k-th iteration, each subdivision is also a sub n-dimensional interval that has an edge length of on each i-th dimension. Definition 2 (The maximum radius of the divided area ). Figure 1. An example of 2-D maximum radius. Let be the central point of the s-th divided area at the k-th iteration, where , and is the count of subdivisions at the k-th iteration. Let be the value of at ; , the maximum value of ; and , the Lipschitz constant of the function f(x). then the value of f(x) in does not exceed . in which the search should be performed. Figure 2. Feasible region and . the criterion is used for determining if sub area should be excluded from further searching. does not satisfy and therefore it cannot belong to the feasible set. Equation (15) is a sufficient condition for . holds and is the outer covering for , where is the possible set of solutions for our nonlinear optimization problem (P). For , the cardinal number of , , and when is a continuum. Define as a sequence comprising , which is some representative point of ; then, any subsequence of must have at least one accumulating point and this accumulating point belongs to . Step 2. Bisect n-dimensional interval . then, discard every non-satisfying and put the remaining into . Step 4. 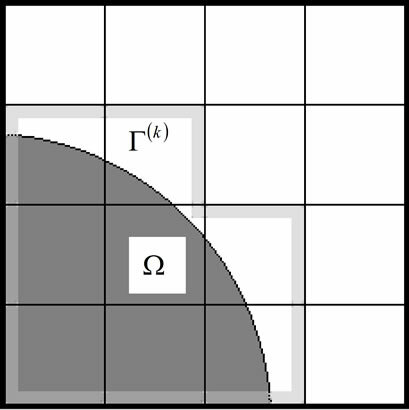 Compute : value of the objective function at each searching point . Step 6. Obtain : maximum radius of divided area for this iteration. if it is satisfied, terminate the iterations and use the tentative solution as the optimum solution. Step 9. Calculate the Lipschitz constant by using formula manipulation considering the result of area judgment in Step 8. Then, return to Step 2. In this chapter, the results of two numerical experiments of our proposed algorithm are shown. The following is a well-known test function called the six-hump camel back function . The followings are the global minimum value and the optimal solution for this test function respectively. In our computer experiments, we transformed equation (17) and solved it as a maximization problem. We set the following four stopping criteria on our proposed algorithm (using variable Lipschitz constant). Therefore, this algorithm stops when it fills one of these four rules. 1) Difference between the upper bound and the lower bound becomes below the (= )2) Number of iterations exceeds 2003) Execution time exceeds 10 min., and 4) Total number of search points exceeds 10 million. 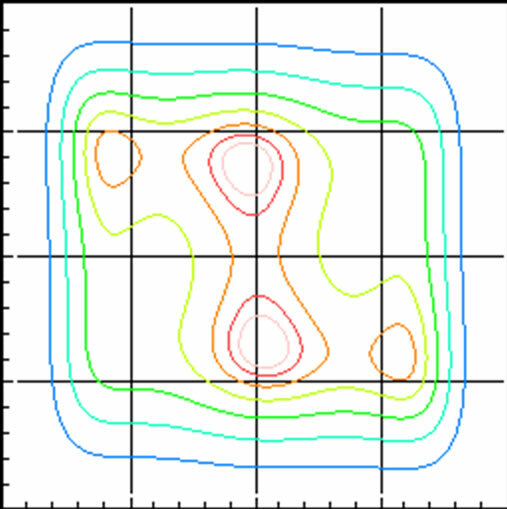 Figure 3 shows a contour line of the six-hump camel back function. 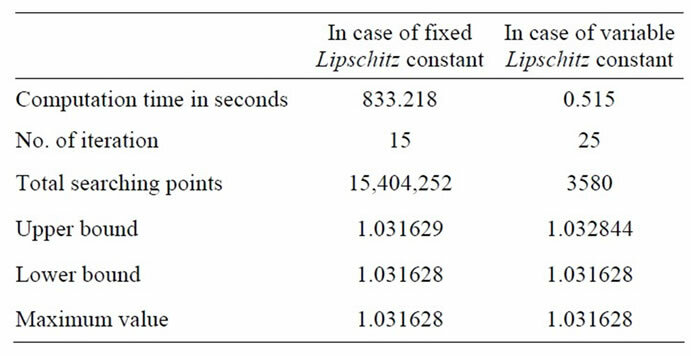 Table 1 shows the comparison of the calculation efficiency by the difference between the fixed Lipschitz constant and the changeable Lipschitz constant. This algorithm was coded with Visual C++ (Version 6)®, and the computer experiments were executed on a personal computer equipped with an Intel Pentium IV® 2 GHz processor. 1) Lipschitz constant is fixed at the initial value, and 2) Lipschitz constant is recalculated according to the different regions. This experiment examines if Equation (2) described above remains effective despite repeated calculations of the Lipschitz constant. This numerical experiment was coded in Visual C++ (Version 6)® and executed on a personal computer equipped with an Intel Pentium III® 450 MHz processor. Figure 3. Contour line of objective function. Table 1. Comparison of two numerical results. In this case, ε in Step 7 of the algorithm was set at 10–6. 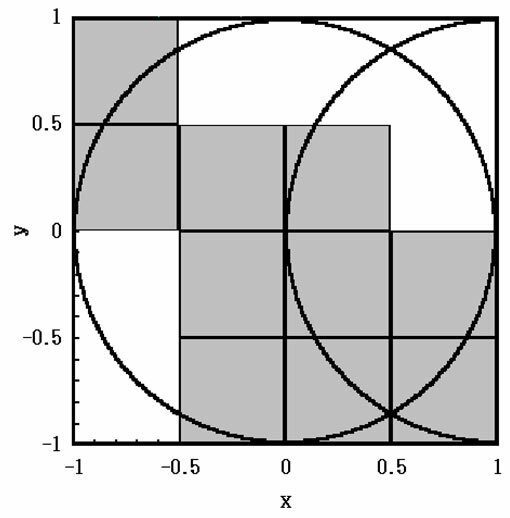 This is done in order to determine if the optimal value of the test function #2 exists in the intersection of the lighter colored part in Figure 4 and shaded area in Figure 5. Figures 6-8 show the branch-and-bound process of the algorithm without changing the Lipschitz constant. 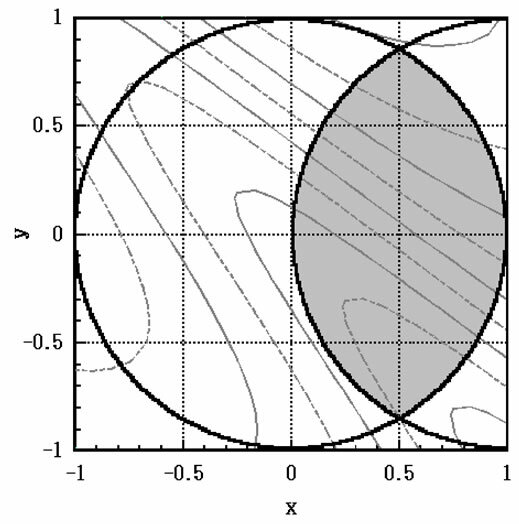 The shaded area expresses the divided area left by the k-th iteration. 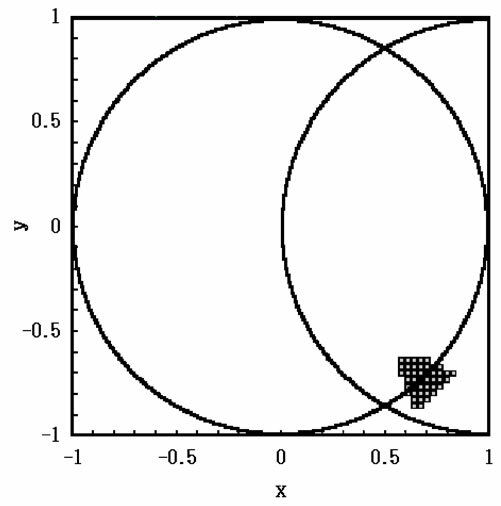 These figures show that the divided area converges to an optimal solution in the feasible region. The solution obtained by this algorithm is (x,y) = (0.68438, –0.72912). 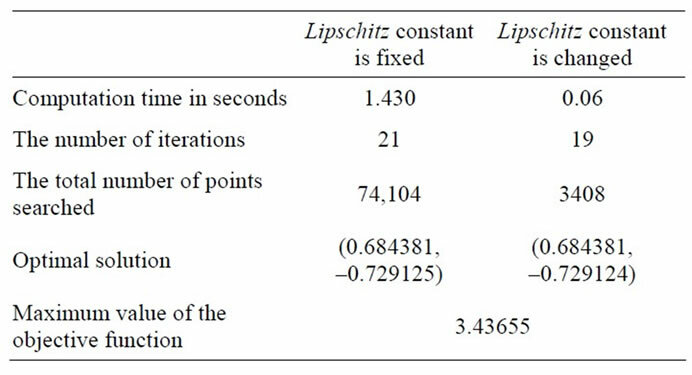 The comparison between the results with and without changing the Lipschitz constant is shown in Table 2. It shows that the method, in which the Lipschitz constant is changed in each iteration, reduces the search area and calculation time. Even if the Lipschitz constant is fixed, the same result is obtained. However, the closer the Lipschitz constant is to the optimal value, the more advantageous the execution of the branch-and-bound operation is. Figure 4. Contour line of test function #2. Figure 6. Feasible region at the 3rd iteration. Figure 7. Feasible region at the 5th iteration. Figure 8. Feasible region at the 7th iteration. Table 2. Comparison of the numerical results for test function #2.
quality in Step 8 of the algorithm clearly shows that the branch-and-bound operation is difficult to use when the product of the Lipschitz constant and the maximum radius is large. However, the solution always converges to the optimal by Step 2. The cost to calculate the Lipschitz constant to obtain a better approximate solution at a little computing time is indispensable. It is the most important to decide the best timing that should calculate the Lipschitz constant for us to reduce all computing time necessary to obtain the final solution. At present, it is impossible to know the best timing for recalculation of the Lipschitz constant. The problem that has been left for the future is how to collect information about the objective function. In order to improve the efficiency of our proposed algorithm, we will apply Dynamic Programming  to it in the near future. This work was supported by JSPS (Japan Society for the Promotion of Science) Grants-in-Aid for Scientific Research (18510132) and the first author’s research was supported in part by the research grants council of NIT (Nippon Institute of Technology). The authors would like to thank Mr. Masao Shinohara, a researcher of NIT, for helpful discussions. T. Shohdohji, “An Algorithm for Obtaining a Global Optimum for One Variable Multi-Modal Functions (In Japanese),” Journal of the Operations Research Society of Japan, Vol. 19, No. 4, 1976, pp. 295-307. A. H. G. Rinnooy Kan and G. T. Timmer, “Global Optimization,” In: G. L. Nemhauser, A. H. G. Rinnooy Kan and M. J. Todd, Eds., Handbooks in Operations Research and Management Science, Volume 1: Optimization, Elsevier Science Publishers B. V., Amsterdam, 1989, pp. 631-662. T. Shohdohji, “Global Optimization Algorithm Using Branch-and-Bound Method,” Electrical Proceedings of the 16th International Conference on Production Research (ICPR-16), Prague, 9 July-3 August 2001. T. Shohdohji, “An Algorithm for Obtaining Global Optima for Multi-Variable Multi-Modal Functions (In Japanese),” Journal of the Operations Research Society of Japan, Vol. 20, No. 4, 1977, pp. 311-320. T. Shohdohji and Y. Yazu, “A New Algorithm for Nonlinear Programming Problem,” Proceedings of International Workshop on Intelligent Systems Resolutions— The 8th Bellman Continuum, National Tsing-Hua University, Hsinchu, Taiwan, 11-12 December 2000, pp. 229- 233. T. Ibaraki, “On the Computational Efficiency of Branchand-Bound Algorithms,” Journal of Operations Research Society of Japan, Vol. 20, No. 1, 1977, pp. 16-35. L. C. W. Dixon and G. P. Szego, Eds., “Towards Global Optimization 2,” North-Holland Publishing Company, Amsterdam, 1978, p. 97. A R. E. Bellman, “Dynamic Programming,” Princeton University Press, Princeton, New Jersey, 1957.